Yesterday we cycled the biggest ascent that I have ever done in one day, although we have been much higher. It was like cycling down into the Grand Canyon and then up twice the height on the other side, between stunning, massive red cliffs. Having a bit of a breather on the way up. but 6 hours later near the top this had dropped a bit to 28°C. The climb was mainly on nice tarmac, but about 19km before the top, just when my legs were really tired, the surface deteriorated to red sand and rough stone stuck lumpily together with a bit of tarmac. When we first left Giron we had to climb 200m on dirt roads leaving us covered in dust from heat toe, including between the teeth. We were going past some very fertile farming land with fields of tomatoes, peppers, pineapples and papayas. As we dropped down into the canyon the temperature rose rapidly. We were hoping for cloud as we knew there would be no shade on the way up and we would not make it if the temperature went up to 40°C. As we contemplated the climb a local driver kindly offered to drive our bags up to the top, but we did not really want to be parted from them just in case. We regretted this an hour later! Looking down at where we had come from. We are only half way up at this point! We had spent 3 days in quaint Giron in Santander, having a bit of a rest, more from the constant noise of loud music and the roaring of lorries than from the cycling. 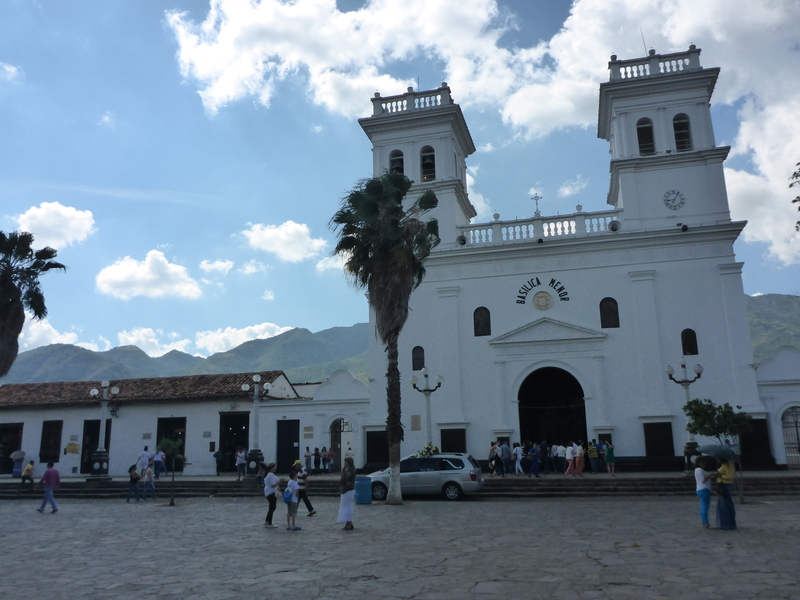 Although it is a touristy place it is full of Colombian extended families, from grandma down to the latest tiny offspring, all enjoying each other’s company walking around the plaza, talking and eating. The eating involves massive quantities of very sweet cakes and puddings (and I can’t blame them as they are delicious). 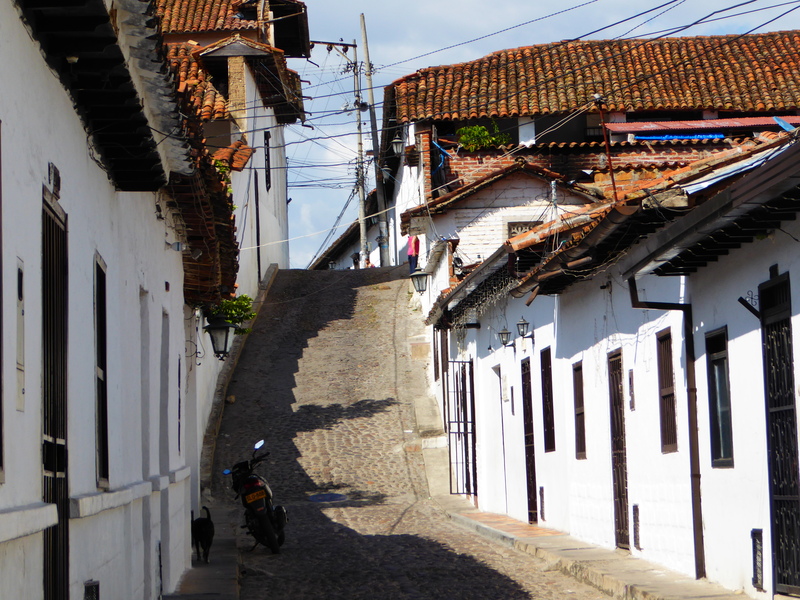 All the pavements in Giron are at least a foot high, sometimes 2 feet high, and the roads are cobbled, so it is amusing to watch the women trying to negotiate the streets in high heels or platforms. As an idea of the area we have put together a video from Giron to Zapatoca. Zapatoca itself is lovely, mild and very laid back. We were there for 6th January which is a big fiesta day in Colombia, the day of the 3 Kings. We were woken at 5 a.m. by what sounded like a band marching down the street followed by a volley of fireworks. On investigation we found these men letting off rockets in the traditional Colombian way. After about twenty rockets they all lept into their trucks and sped off before the police arrived. We had a lovely surprise a few days ago as we got a phone call at the hotel from Marina, who we had met on our hike to the Lost City before Christmas. She had been following our route on the blog and had worked out which hotel we were staying in, so she dropped in for a chat on the way from the airport to her parents house. We spent the following day in Bucaramanga with Marina and visited her lovely family. Thank you all for your hospitality and special love to Delia. Marina, we hope to see you again when we get to Bogota. I just wanted to say something about communication, how important it is when you are travelling and how difficult we are finding it. Before we came to Colombia we did an 8 week evening class in Castillian Spanish (it was the only option) and we have been listening to an online Spanish course, which is mainly castillian unfortunately, most evenings and I think we are getting on quite well with our Spanish. But, when we try to communicate, for example in a café, usually with a tried and tested sentence, they take one look at us, think “foreigner” and decide that they won’t be able to understand us whatever we say. Several times we think we have ordered as the waitress has repeated what we said and written it down, then 10 minutes later another waitress is sent over to try again, then insists I go with her to point at the type of raw meat I want them to cook. Restaurants are particularly difficult as there are never any menus. In one breath and with no pauses between words the bored waitress will reel off everything that they have and I will order the one word that we understood, although this is never what we get. Or the waitress will come over and with no other information expect us to order. The last time this happened I just ordered what I felt like eating, which was scrambled eggs and arepas. So she went to the nearest shop, bought the eggs and cooked them. All the smoke from the BBQ keeps the file’s away, but I didn’t fancy the meat. The couple behind the smoke are buying milk. Cooking my eggs and arepas, which were really good. Cycling 20km before breakfast gives you a good appetite. So maybe this is how we should order in future. We have been told that context is all important in Colombian Spanish. You can’t assume that as you mentioned say a cat in the first sentence that everyone will know you are still talking about the cat in the second sentence unless you specifically mention the word. This leads to much misunderstanding, so I have been trying to improve my Spanish grammar as well. Of course none of this helps with understanding the answer, which is usually long and fast! Just a reminder that we are fundraising for ShelterBox during this cycle trip. ShelterBox is a humanitarian charity that provides shelter for families who have suffered disaster such as after the earthquakes in Ecuador as well as elsewhere in the world. If you would like to donate directly to ShelterBox click on the donate button at the bottom of this blog if you are reading this in our website, or go to the ShelterBox link. To find out more about ShelterBox go to our Links and Tracking page and click on the ShelterBox link.